LOL this had me giggling cause I am so guilty of this! Well, actually I have taken the sheets off and then put a blanket down as a sheet! So who can admit it?? I've never done that, but not because I'm such a great mom. When my oldest wets the bed, she doesn;t wake up. Or if she does, she goes back to sleep. Nice huh? Last night she wet the bed for the first time in months, I was so annoyed this morning when I discovered it. 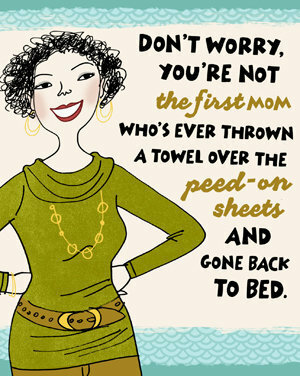 Never done it with pee but did it all the time with breastmilk! I've done it MANY times! Grace has been in a phase where she consistently pees through the diaper and sheets every single night and even at naptime! The position she sleeps in just doesnt work with a diaper! At 5 am when she is crying, I just want to get back to sleep as fast as possible, I usually throw a think blanket over the top, change her and stick her right back in bed then wash it all the next morning!